As in any respectable Tonkatsu restaurant, there are two things you can't live without: free-flow cabbage, and grind-it-yourself goma. Tonkichi delivers both. 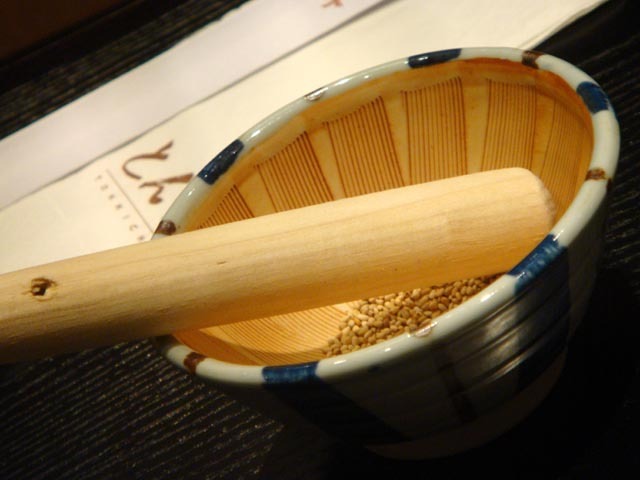 It's nice to smell the sesame seeds as you grind them, as it stimulates your appetite in preparation for what's going to be served next. 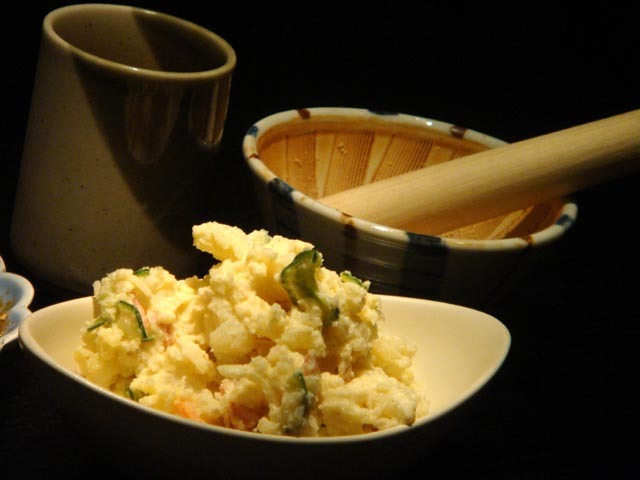 The potato salad was rather tasteless and not as tasty as the ones I had in Japan. Perhaps lacking in mayo, possibly healthier, but not really worth ordering at my next visit. The horenso goma ae, spinach with sesame sauce, was rather strong in flavour, too sweet for my taste and lacked of balance. A dish you might want to order if you are a spinach lover, but you might be disappointed if you ever experienced what a proper version of it should taste like. Now, this is what you come here for: the Tonkatzu. There are two versions: Hire and Rosu. 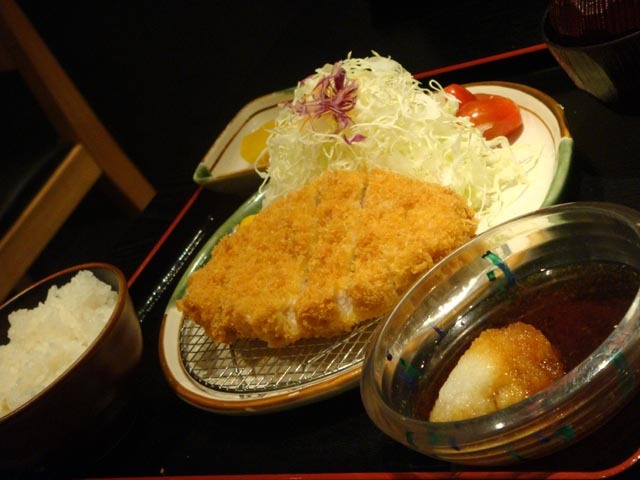 The one in the picture is a rosu tonkatzu with oroshi (grated Daikon - white radish) on the side. I usually prefer Rosu, which is fatter, juicier and tastier, while hire tends to be leaner and drier. I have o confess that both cuts were equally good in different ways so perhaps the first time you visit this place it might be worth ordering a combo platter which includes both. It will give you a chance to taste both and compare them. The tonkatzu was of good quality, although the battered coating was slightly too think for my taste. Their style is to make the coating quite thick and crunchy, to add an outer layer of texture and maintain the meat juicier in the inside. Some prefer this style. My preference would be a thinner coating (which is not as filling) preserving the same juiciness of the meat, while enhancing its flavour without suffocating it with an 'over-bread-crumby' texture. 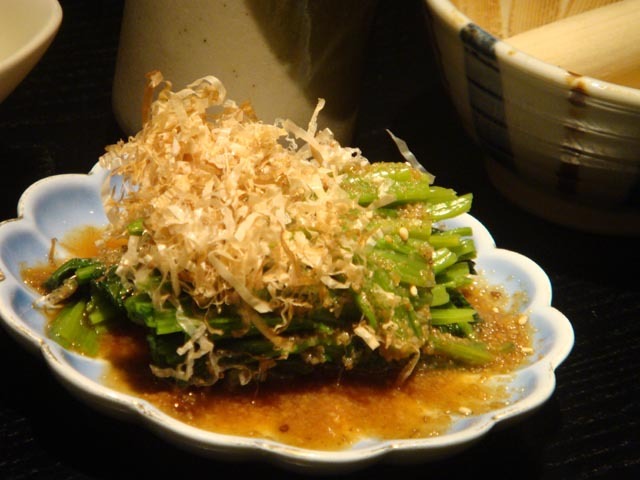 Tonkichi is regarded as the place to go for Tonkatzu in Singapore. Although it might give you the best value for money, I would rather enjoy my kurobuta tonkatzu at Tomton (see separate review). Perhaps slightly most expensive, but worthwile the calories.